Throughout 2017, the Cyclotron Institute celebrated 50 years of beam on target. This culminated with a symposium held November 15-17, 2017 on the campus of Texas A&M University in College Station, Texas, USA. Thank you to everyone who participated in the symposium, the banquet, and the recognition events! Our symposium has been covered by The Eagle, The Battalion, and the College of Science. Photos from the event are now available. A video on the 50 years of beam is available in normal and extended lengths, as well as a video about the Institute itself. The conference photo has been posted. Read the letter from the DOE Associate Director of the Office of Science for Nuclear Physics, Timothy J. Hallman, regarding the 50 years of beam at the Cyclotron Institute. 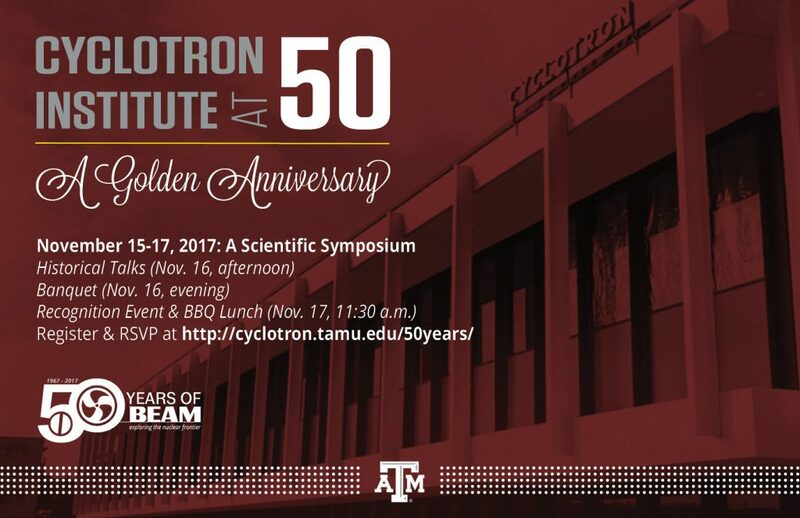 In addition to the scientific program, we had historical talks given by former Cyclotron Institute directors, tours of the Cyclotron Institute, a banquet, and a barbecue.